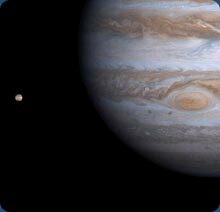 Jupiter is the largest planet in the solar system. It was named after the most powerful Roman god due to its enormous size—about 1,300 Earths could fit inside the planet. Jupiter rotates very fast—a day lasts just 9 hours and 55 minutes. At an average distance of about 470 million miles from the Sun, a year lasts a relatively long 12 Earth years. Jupiter is a gas planet, which means that it is a giant cloud mainly composed of hydrogen and helium, held together by gravity. The planet has at least 47 satellites, the two largest of which are both larger than Pluto and Mercury. The four largest moons are Ganymede, which is made of rocky ice; Callisto, which has thousands of craters; Io, which has active volcanoes, and Europa, which is a giant ice ball. Because Jupiter is a gas planet, it has no real surface. The swirling gas clouds create a sort of weather, however, that includes storms. The most well known of these storms is the Great Red Spot, which is visible in photographs of Jupiter. Join our scientific newsletter for parents of young kids. Our favorite space explorers Peter and Paul will fly with you through space and teach you about our vast solar system.